AHM first released this Saddle Tank 0-6-0 model in 1975. A 1977 advertisement from AHM includes this model and provides a $17.98 retail price. Origin markings on the underframe show Hong Kong as the location of construction with AHM’s name present above. 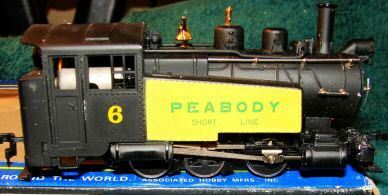 You’ll also find this Saddle Tank 0-6-0 model in Bachmann’s HO line in the 1970s. The model came from Kader, Bachmann’s parent company. For a time in the early 1970s, AHM imported HO freight cars, an FT diesel, as well as this Saddle Tank steam switcher from Kader.